If Transportation Security pat downs at public venues, thousands of drones over the skies of America, and the National Security Agency’s new Echelon-like listening center in Utah weren’t enough to convince you that we’re living in a police state, then perhaps the latest news out of Chicago will change your mind. As world leaders prepare to meet in the windy city for their annual NATO summit, U.S. federal officials are working feverishly to implement a security net so broad that it encompasses the entirety of Cook County, Illinois. While international summits are traditionally met with a larger police presence and preparations for the possibility of protests or rioting, what’s taking place on American soil in anticipation of the May 20 meeting in downtown Chicago can be interpreted in only one way – the implementation of regionalized martial law. Last week Red Cross officials reported that the City of Chicago, Department of Homeland Security and the Secret Service had instructed them to prepare for a mass evacuation of the city in the event of an emergency during the NATO summit. The Red Cross was to prepare to shelter and feed residents in the event of such an evacuation. On the heels of that announcement, more details have emerged and they suggest the Federal security apparatus has completely lost its marbles. The Illinois Department of Transportation is testing an emergency plan to shut off access into and out of downtown Chicago. The plan uses a network of highway security gates that are designed to shut down all traffic coming in and out of Chicago in the event of a terrorist attack. The Illinois DOT is warning truckers that it’s best to avoid the city during the NATO Summit in Chicago May 20-21. There will be a number of driving restrictions and rolling street closures, and the Illinois DOT is testing highway barricades that will block access to all major highways in and out of Chicago. These barricades, which started being installed on Chicago highways back in 2005, are deigned to restrict or cut off access to roads during an emergency like a bioterrorism attack. …The Illinois DOT’s testing of these highway entrance ramp gates has many worried about the chaos that NATO may bring to Downtown Chicago. There is already talk about widespread city wide evacuations, rioting, terrorist attacks and even large scale detention centers and arrests. It’s been reported by the local media, that Cook County Sheriff Tom Dart is devising a strategy to deal with large-scale mass arrests during the NATO Summit meeting. In fact, the Chicago Sun Times is reporting that the once abandoned Joliet State Prison may be reopened as a mass detention center for NATO. Joliet prison is about 40 miles from Chicago and can hold about 1,300 prisoners. The Sheriff is also reportedly looking at building tents in the yard at Cook County Jail. Starting May 1st, a full three weeks before the NATO Summit, the Federal Government will be setting up a Militarized Red Zone in the streets of Downtown Chicago. The head of Chicago’s NATO Host Committee said Thursday she was blindsided by the federal government’s decision to create a militarized “Red Zone” in the Loop to protect federal buildings in the run-up to the May 20-21 summit at McCormick Place. The news of federal agents on the streets of Chicago isn’t sitting well with many. From last months urban warfare drills, to residents being warned of possible citywide evacuations, the city of Chicago is starting to look like a city that may already be under martial law. …according to a CBS 2 report, the Secret Service has refused to even acknowledge the issue and “Chicago officials say the plan didn’t come from them. …Despite the fact that the plan for evacuating citizens has stoked paranoia and confusion amongst residents, information about the procedure has seemingly been placed on lockdown. What we do know is that the Red Cross and local government are preparing for mass evacuations of thousands of residents in case of a “national security event”, barricades are being set up to control traffic in and out of the city, city highways and streets are being completely shut down to restrict any non-official access, mass detention centers are being prepared to hold hundreds of detainees, and heavily armed security teams will be deployed weeks ahead of the summit to acclimate residents to the militarization of their city. There also are reports that a heavily armed security team will start making a very public appearance around federal buildings in the Loop this week. Officials with the Chicago NATO host committee were completely in the dark. They had no reports of any such plans. Either national intelligence agencies in the United States have gotten wind of an attack to take place in Chicago in May, or they are overtly creating a manufactured crisis to instill in Americans that absolute power over our homes, lives and daily activities lies in the hands of our benevolent, all-seeing government. For those who bury their heads in the sand and want to pretend like national security centered legislation is meant to protect us from ‘terrorists’ and not to restrict the freedoms of average Americans, look around. The control grid is being put into place, it’s happening right here and now, and it’s no longer covert. 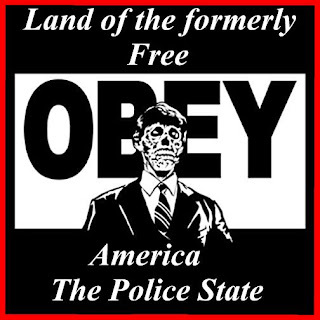 The powers that be are showing us exactly what the plan is and they’ll implement it city-by-city, town-by-town, one American at a time – until every single one of us is living in a state of fear and compliance.